ten of us would never have been here. And Kate Noakes recalls ‘the countless times you’ve saved me, thankfully’ from asthma attacks. Yet the book isn’t all about celebration. Most of these poets are, or have been patients, or are mourning the death of someone close to them. A few work for the NHS, like Roy Marshall, whose “Student” describes his part in preparing corpses. 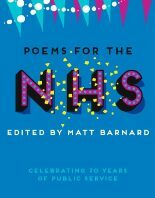 There is one political poem, “Picket Line, April 2016”, by Hannah Stone, in which we are surprised to see junior doctors with ‘scarves not stethoscopes’ round their necks. Not much is said about the financial pressures on the service or the fact that ambulance crews are regularly attacked. your constellation rises to meet me. The metaphor isn’t about actually believing in a horoscope; it’s about mystery. There is no ‘excuse me’ when dancing with the Crab. This is an invitation you can’t refuse. Taking your hand, he leads you out of your life. the fear of the previous patients. And Rachel Burns winces as a nurse injects ‘nuclear venom into my veins’. No, we would all much rather not be in hospital. the thermometer homing in on its open mouth. no longer in pain, a sheet over your face. Larkin had things to say on the same subject. I must force myself to re-read him. The Cane, by Mark Ravenhill, Royal Court Theatre. Review by Gary Beahan. A place that exists only in moonlight. Turner Contemporary. Katie Paterson & JMW Turner. Review by Fiona Sinclair.